A river is the most human and companionable of all inanimate things. It has a life, a character, a voice of its own, and is as full of good fellowship as a sugar maple is of sap. 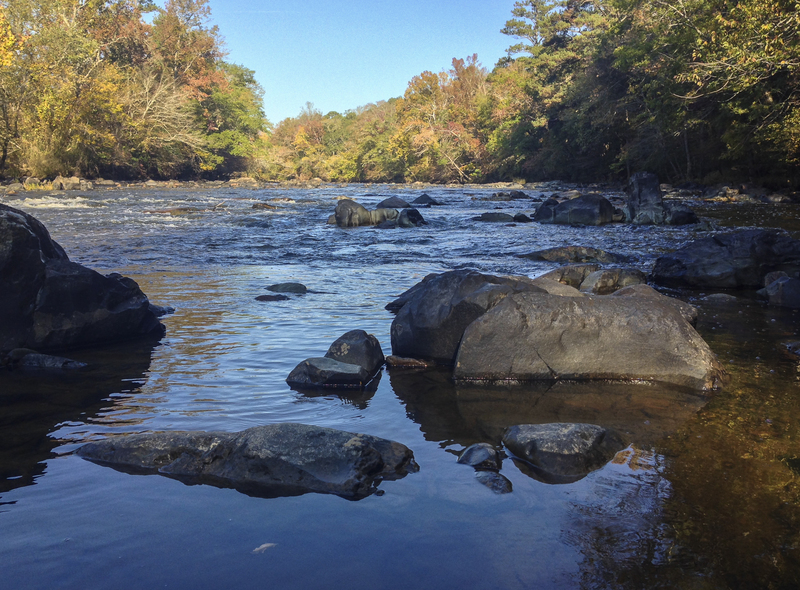 Fall color is starting to peak here in the Piedmont of North Carolina so I thought it would be a good time to hike along the nearby Haw River. 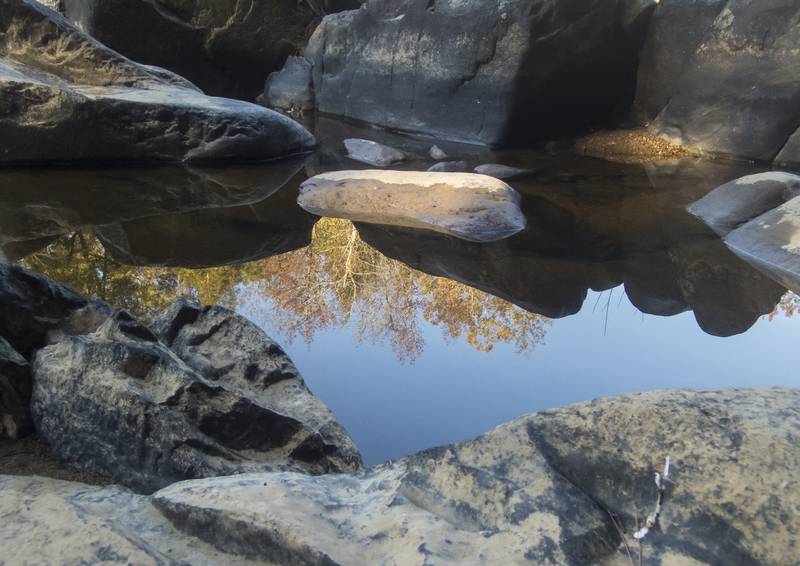 The Haw is part of the Cape Fear River basin and the stretch that runs through this area is gorgeous, especially in early morning or late afternoon light. Last Friday, I got a ride down to the Hwy 64 bridge and hiked upriver a couple of miles to our neighborhood. I traveled light – the usual binoculars, a hiking pole to clear the path of spider webs, and my new Olympus Tough TG-4. The early morning light accentuated the arboreal palette and made me wonder why I had waited so long to enjoy this beautiful hike. 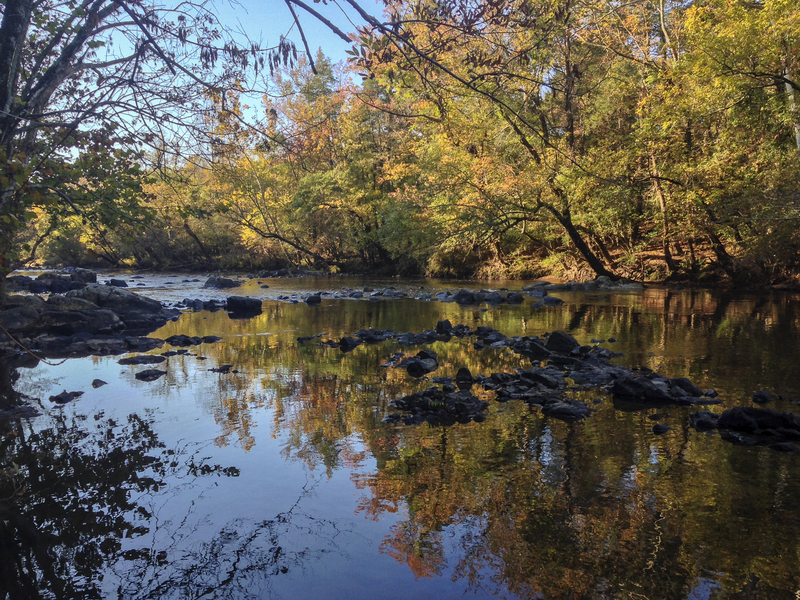 A few years ago, about 1000+ acres along both banks of this stretch of the Haw were acquired by the state as the Lower Haw River State Natural Area. The actual trail lies along a little over 4 miles of the east bank, from the Hwy 64 bridge to Bynum. For a couple of miles it runs along the boundary of our community, making for easy access to enjoy the sights and sounds of the river. The path is narrow, occasionally littered near its start by thoughtless bank fishermen, but you soon leave that and the road noise behind and are accompanied by the gurgling sounds of water over rocks. 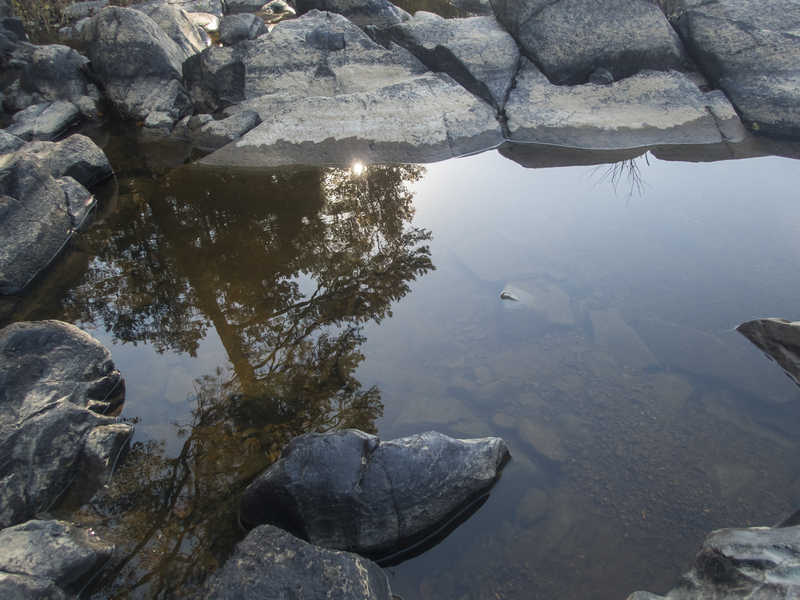 On this day, the river flowed gently over, and between, the many rocks that line its corridor. 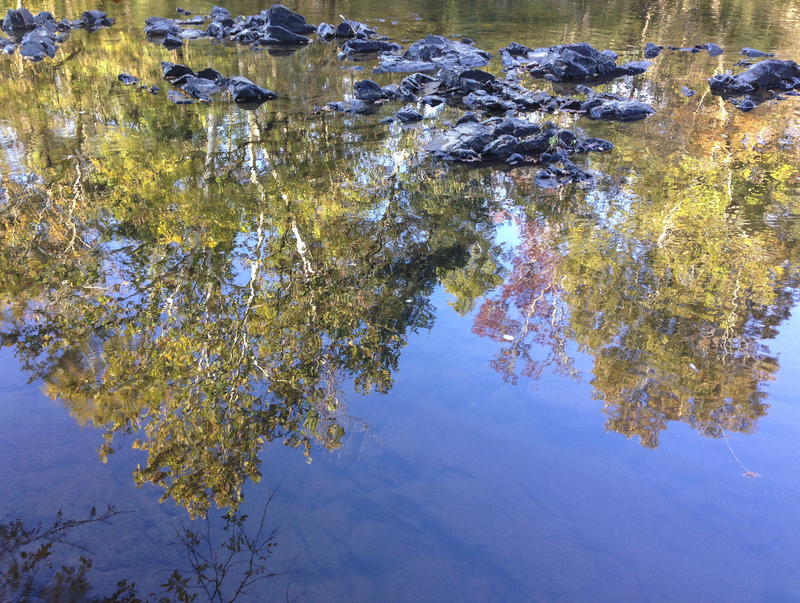 Evidence of recent high water is suspended in the shrubs and trees along the bank, but now I can step out into the river on the many exposed boulders that frame quiet pools. There still is enough flowing water to muffle many of the sounds of the forest along the trail, but I did hear the unmistakable chirping of a Bald Eagle at one point, before realizing it was perched in a tree right next to me. As I slowly eased toward the river bank, it flew across and perched in a large Sycamore, so I moved on, leaving it in peace. I saw a few other birds along the way, plus a lot of animal sign like Beaver chew marks and the tracks of Raccoon and White-tailed Deer. And, since it was a warm and sunny morning, there were plenty of insects and spiders out and about. A hatch of caddisflies was happening on the river, and several of these tent-winged insects landed on me as they began their aerial existence from what has been their aquatic home. I also encountered more than my share of spider webs strung across the trail (always a good sign that you are the first person to hike a trail that day). 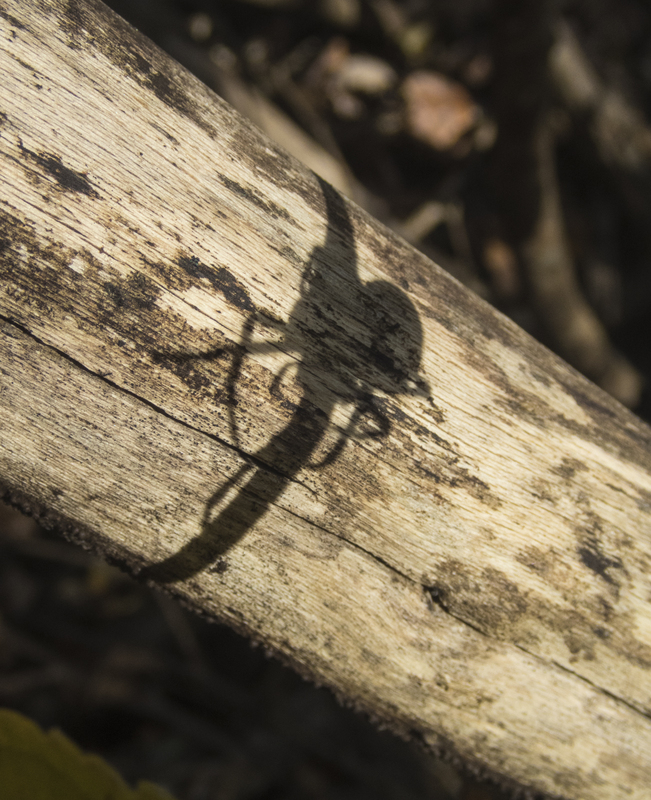 After scrambling up the bank at the main creek crossing along this section of trail (there are no bridges for the side creeks feeding into the Haw), I saw one of my favorite autumn arachnids. 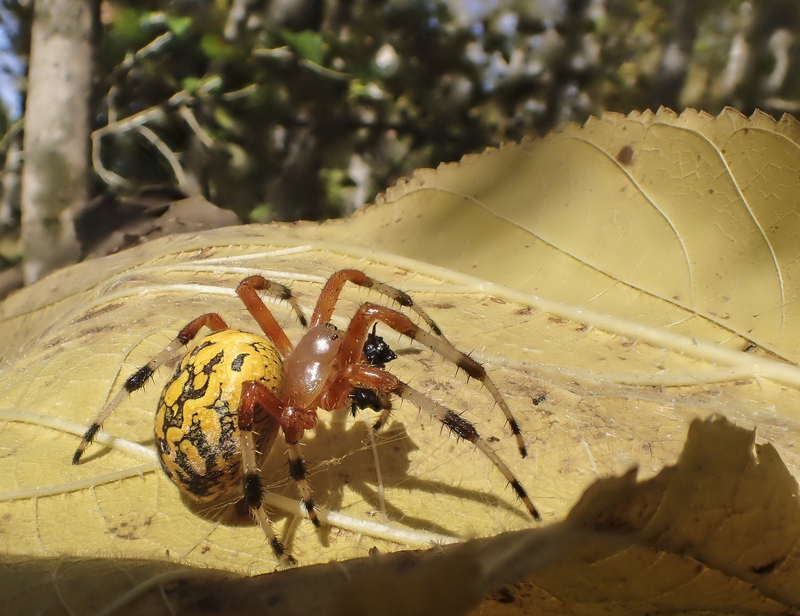 Marbled Orbweavers, Araneus marmoreus, are large, brightly colored spiders, most often seen in late summer and fall. This one is a female, much larger than the males as is so often the case in the world of spiders. She was hiding in her daytime retreat, a curled leaf, off to the side of her large circular web. She pulls the leaf into a curl with silk and then hides in the safety of the retreat awaiting a signal from a struggling prey. She is able to feel their floundering via a strand of silk, a signal line, that runs from the center of the web to her hide. Unfortunately, I had stumbled into her web as I climbed over a log, and pulled open her retreat. She posed for a few photos in the morning sun, and then I placed her back on the limb where some of her web remained. 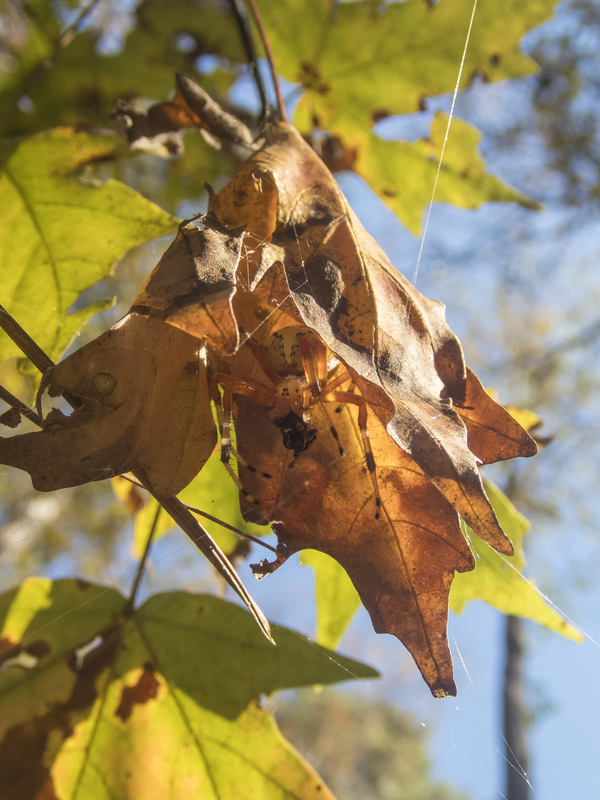 Just a few feet from that limb was another large web, and, sure enough, another spider hiding in a leaf retreat. 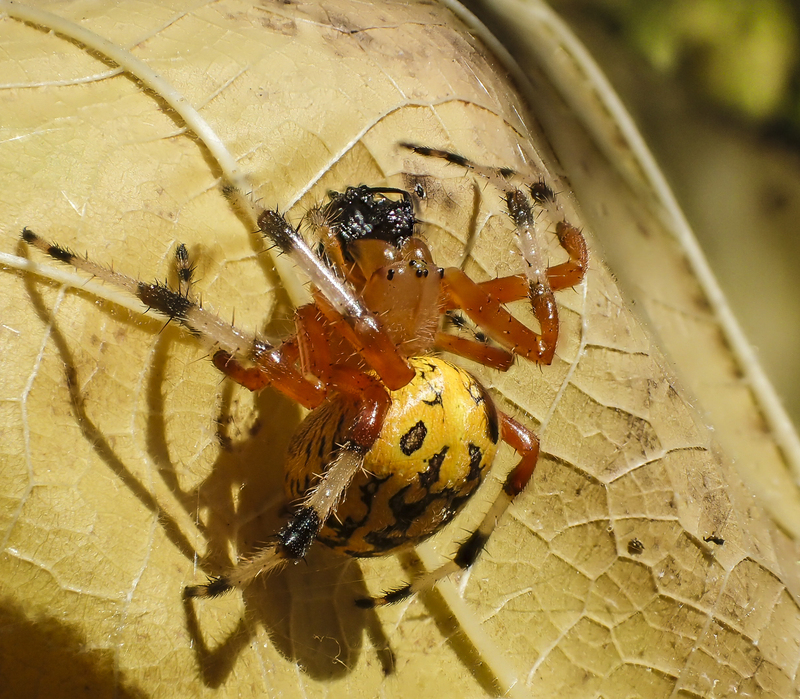 The colorful abdomens of these spiders tend to darken with age, so many appear bright orange by late October. This has given rise to another of their common names, the Halloween Spider. Perhaps this species is one of the reasons spiders are often associated with this spooky holiday. Several scientists even started a spider awareness campaign on Twitter for the month of October to take advantage of this perceived connection – #Arachtober. They have some incredible photos and fascinating information about this too-often misunderstood group of invertebrates. In honor of their efforts and the important role that spiders play in our world, I will try to post a few more spider topics this week. This entry was posted in Natural History and tagged haw river, marbled orb weaver, spiders by roadsendnaturalist. Bookmark the permalink. great walk by the river, and wonderful photos of our marbled orb Weavers…I am constantly checking those curled leaves for their hideaways. We have loads of them by Bolin Creek, where I have noticed certain clusters of them every year. Thanks, Mary. I always enjoy finding these spiders – they are just incredibly beautiful and so fitting for the season.